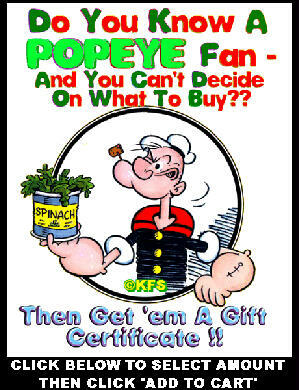 Spinach Can Collectibles - All the Popeye memorabilia, gifts and souvenirs you could want. Popeye, Olive Oyl, Bluto, Wimpy, Swee'pea, Jeep - etc. are all here. Posters, t-shirts, glasses, key rings - the Popeye store has them all. The spinach-eating sailor, created by E.C. 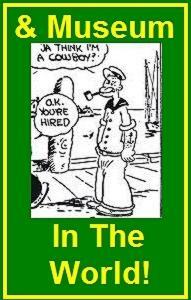 Segar, is the star of Spinach Can Collectibles. 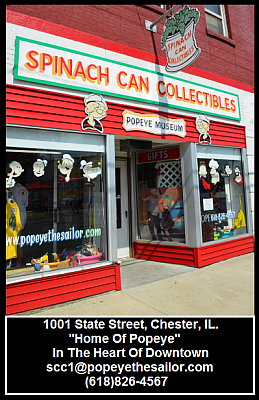 Our store and museum in Popeye's Home Town of Chester Illinois carries a vast stock of Popeye goodies - and we will ship within a day or two - to anywhere in the world. 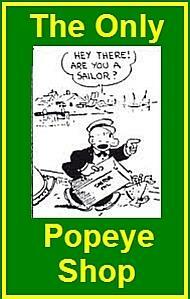 IF YOU WANT POPEYE GOODIES - WE HAVE THEM!! Not Responsible for Lost or Stolen Items!! We Also Deal in Consignments! 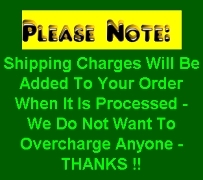 We Purchase Entire Collections - If Reasonably Priced! We want to hear from you and are not ignoring you. If you attempt to contact us (especially WEB-TV users) and do not get a response in a day or two, please copy our e-mail address and shoot us another message or give us a call - (618)826-4567. We want to serve your requests. Thanks. 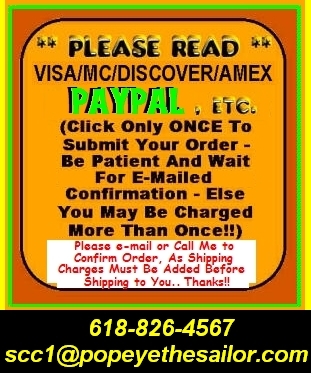 Click On Image To Leave A Comment Or Request More Info. 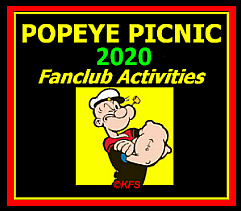 Popeye, Olive Oyl, Wimpy, Bluto, Swee'Pea, Jeep, etc. and Betty Boop - internet shopping for all your Popeye gifts and toys, old and new. 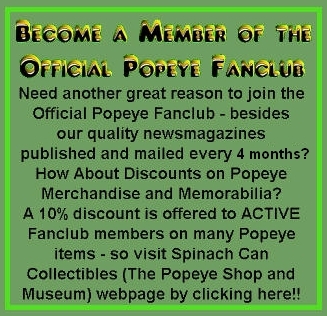 Popeye collectors can find all the Popeye memorabilia, books, videos, postcards and posters here! Visit the Popeye museum in Chester, Home of Popeye.